At the second annual U.S. Zero Waste Business Council conference held at the Westin Cincinnati May 8 & 9, a common theme emerged from the first day of excellent presentations: Know Your Trash, up close & personal! Hiring a company to perform a waste audit creates a baseline; participating, literally hands-on, in a waste audit creates a visual of the task at hand. When corporate management witnesses first-hand the waste inherent within operations, a company culture emerges that facilitates creation of zero waste practices that are standard operating practices. The second conference was a powerful encore performance following the first USZWBC June, 2012 conference in Costa Mesa, CA. 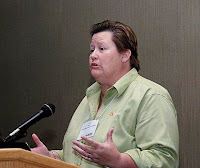 Visit the ZWA Blog post, USZWBC hosts first-rate conference, for a program overview. The Ei FB album, 06-12 US Zero Waste Business Council Conference, is a conference pictorial recap. After a hearty welcome from City of Cincinnati Vice Mayor Roxanne Qualls, the stellar 2013 program launched with Robert Bottom's of Honda of America Manufacturing keynote presentation on Honda's zero waste commitment: 94% of material generated is recycled! Robert highlighted associate engagement via an individual and team-based point system. Three excellent panels along with a small group break-out discussion session were the format for the remaining first-day program. The Leading the Way: Businesses and Zero Waste - Diverting over 90% from landfill, incineration and the environment panel included Corey Hawkey - The Ohio State University sustainability coordinator, Scott Stephenson - Mitsubishi Electric America corporate manager, and Mark Fisher - Cincinnati Zoo director of facilities, planning & sustainability. In his presentation on OSU's football stadium zero waste achievement, Corey mentioned the first step was a waste audit to understand the material generated. With an average of 105.000 fans per game, OSU led the way to zero waste at major collegiate sport stadiums with no precedent to follow. For more details on OSU's monumental final game 98.2% recycling rate, see the ZWA Blog post, Power of the Voice. Know what is in your waste - participate in regular in-house and off-site waste audits; get over "getting dirty" and "bad smells"; take lots of pictures as they tell the story. Remove what can be recycled or reused - a plastic film baler paid for itself in two years; a polystyrene densifier paid for itself in 2 1/2 yrs; 2 tons of coffee grinds per year are composted & given to employees for their home gardens. Reduce what cannot be recycled - began purchasing consumable items in smaller quantities, which reduced unnecessary usage. Maximize waste awareness - 20% of associate bonuses are based on maintaining the 98% recycling rate; Wall of Shame - pictures are taken of associate trash | recycling containers and posted on the Wall of Shame when zero wastes practices not followed. One of the most entertaining presentations was Mark's overview of the Cincinnati Zoo's road to zero waste from its 2005 baseline - 0% diversion rate, not even aluminum cans were recycled! In less than eight years, the Zoo is a hallmark of sustainability, zero waste and beyond. Once common recycling was addressed, Mark focused on how to compost 1000# of elephant poop generated per day. With an available destination and hauler in-place, the significant challenge was creating in-zoo transport logistics with no overtime. Mark secured 100% buy-in from the staff and it took six months to figure out a working system. Result: smaller animal areas asked to include their "poop" in the collection system. With 1.4 million guests per year, the Zoo sees itself as a role model for public education on the importance of zero waste and sustainable practices. The Zoo is on a relentless pursuit of improvement using common sense with simple, frugal solutions. A Zoo mantra: Let's do it better! After a relaxed lunch, the vigorous program resumed with the How to get to Zero Waste panel: Tom Wright - Whole Foods sustainability consultant, Scott Burns - Procter & Gamble Global Asset Recovery Purchases associate director, and Kelly Harris - MillerCoors sustainability development coordinator. Tom lead off the session with an overview of Whole Food's impressive sustainability commitment and achievements. To start his presentation, Scott showed an image-only short video to emphasize the magnitude of P&G's global impact on our daily lives. In 2007 Scott was selected to develop an internal program to identify where valuable products and material were treated as trash. As a result of his call to action, Scott created GARP. In six years, GARP grew to 35 employees and is responsible for a collective $1 billion in cost-savings, often by donating important products to third world countries. As of this post, 46 plants around the globe achieved zero waste status. Scott tells an amazing story of how 750,000 infant diapers (30 tractor trailer loads) were collected by charity within hours before landfill destination. Months later Scott was in Haiti on a medical mission where he first-hand witnessed the diapers serving a vital community need. Hearing Scott tell the story puts into perspective the importance of redirecting unused, unsalable products, rather than taking the easier landfill route. As an encore presenter from the 2012 USZWBC conference, Kelly gave an impressive update on MillerCoor's brewery in Golden, CO - the largest brewery in the world. In addition to zero waste achievement, the brewery reduced energy consumption 29.3% year-to-date in 2013. The brewery, which uses 4 million gallons of water per day, reduced water consumption by 8.5% or 340,000 gallons per day. Kelly spoke on how sustainability programs requires a sales approach to associates and a culture shift within the organization. Employing the KISS - Keep It Simple Stupid - philosophy, Kelly achieved 100% recycling program improvement by color coding the entire brewery. One of Kelly's mottoes is: Stop - Is it Recyclable? Truth is almost everything is reusable or recyclable; if not, it is replaceable. The day's program ended with the Markets and Innovations panel moderated by USZWBC president Gary Liss - Gary Liss & Associates: Sue Beets - SBM Management corporate sustainability manager, Terry McDonald - St. Vincent de Paul executive director, Amy Moreland - Heritage Interactive Services director of international business & supplier relations, and Marty Metro - Used Cardboard Boxes. Leading the panel with her Value of Materials presentation, Sue noted SBM Management has 19 years of sustainability management experience and in 2012 managed 38 major recycling locations. In 2012 SBM's award-winning recycling program diverted 117 million tons of material from landfills and generated $11.9 million of documented client savings - IMPRESSIVE! After her overview of the commodities market and process steps, Sue emphasized the importance of assessing the "whole picture": labor, equipment & hauling charges and material value. Often janitorial costs are the least expensive component. In closing, Sue spoke of the important role solid waste and recycling monthly tracking progress plays in successful programs, a perfect segue for Amy's Tracking Your Success & Difficult Waste Streams presentation. With the recent IS2 Data Management System launch, companies may now benefit from the incredible tracking system previously only available to Interactive clients. Documenting progress and success is integral to defining program status and taking it to next levels. As a by-product and logistics management company, Interactive works closely with clients, at times with on-site staff, to create cost-saving systems where the corporate bottom line and the environment benefit. Next Terry gave an impressive presentation, Spinning gold from waste, on the valuable role the thrift industry plays in material recovery. Beyond the social impact, St Vincent de Paul's reuse, recycling and upcycling efforts contribute to a community's ability to divert valuable material from the landfill. Finishing out the panel, Marty gave compelling testament in his Reuse a multimillion business on the tremendous economic cost of limited product reuse, even if it goes to recycling. The fast-paced program ended with a lovely reception where conference attendees recapped the day in a relaxed, social setting overlooking Cincinnati's fountain square. Elemental Impact was well represented at the conference with numerous Ei Partners serving on various panels throughout the two-day conference. On the first day, HIS presented while BASF, HMSHost, CleanRiver and Piazza Produce were scheduled on the second day. Ei founder Holly Elmore orchestrated and moderated the Zero Waste is a Team Sport panel. In addition to "Know Your Trash" several other common themes intertwined the presentations. After top management buy-in, securing associate engagement supported by consistent, repetitive training was emphasized. Rewarding employees for program participation along with system improvement suggestions was key. On the other hand, peer pressure is an excellent motivator for the late adopters and nay sayers - LOVE the "Wall of Shame!" From a basic perspective, simplicity is best when developing program parameters and logistics. With a variety of industries along with non-profits showcasing their success, it was empowering to understand common ingredients underlie zero waste programs that improve the bottom line. Conference PPT presentations are available for download on the USZWBC 2013 Conference page. For a pictorial recap of the USZWBC second annual conference, see the Ei FB album, 05-08-13 USZWBC Second Annual Conference. The conference second day is featured in the ZWA Blog post, Zero Waste Success Requires WE Consciousness, along with the Ei FB album, 05-09-13 USZWBC Conference - Food Waste Focus, for the pictorial recap. For an overview of the second day panel of Ei Partners moderated by Holly, see the ZWA Blog post, Zero Waste is a Team Sport, a powerful panel. Kudos to the USZWBC for hosting a second stellar conference! Thanks for reading the post and taking the time to give the link to your curriculum. Note the point of the post is you must first know what you are producing before taking effective steps to reduce, "pre-cycle," recycle or otherwise reduce what is sent to the landfill. have it discussed widely so that we can gain more objective opinions. i merely wanna thank you intended for discussing your information whilst your web site. This web site are usually excellent in addition to appreciative. I would like to thank you for the efforts you have made in writing this article. I am hoping the same best work from you in the future as well. In fact your creative writing abilities has inspired me to start my own Blog Engine blog now.